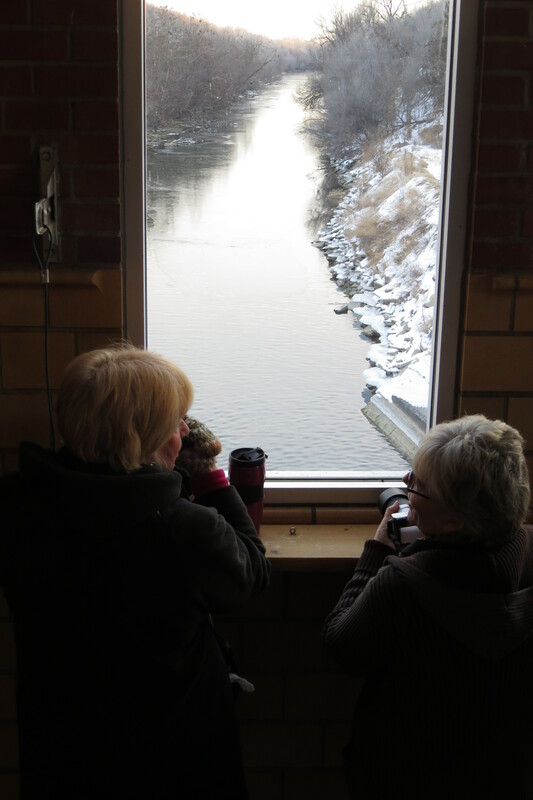 Fellow Kearney Hub staff writer and longtime NFPW member Mary Jane Skala and I spent our Saturday morning doing some birding. It still will be about five weeks before we see the first of the 600,000-800,000 migrating sandhill cranes in the Central Platte Valley, but there are some overwintering geese. Our mission Saturday was to see bald eagles. We have some eagles that stay in south-central Nebraska year round and some that migrate. They hang around some of the bigger lakes – Harlan County Lake down on the Republican River, and Johnson, Elwood and Lake McConaughy in the Platte basin – and can be seen along the Platte River channels, if you know where to look. Before sunrise, we headed about 40 miles southwest of Kearney to the Central Nebraska Public Power and Irrigation District’s J-2 hydropower plant, just below Johnson Lake and southeast of the town of Lexington. Bald eagles gather there because the irrigation canal downstream of the powerhouse remains open, flowing water as a result of warm water leaving the hydro. So, viewing generally is best in the long, cold conditions we have now because the lakes and rivers are mostly iced over. Eagles can’t drill through the ice like ice fishermen, so they rely on the remaining flowing water to fish. They also hunt for small mammals in our harvested cornfields and grasslands. 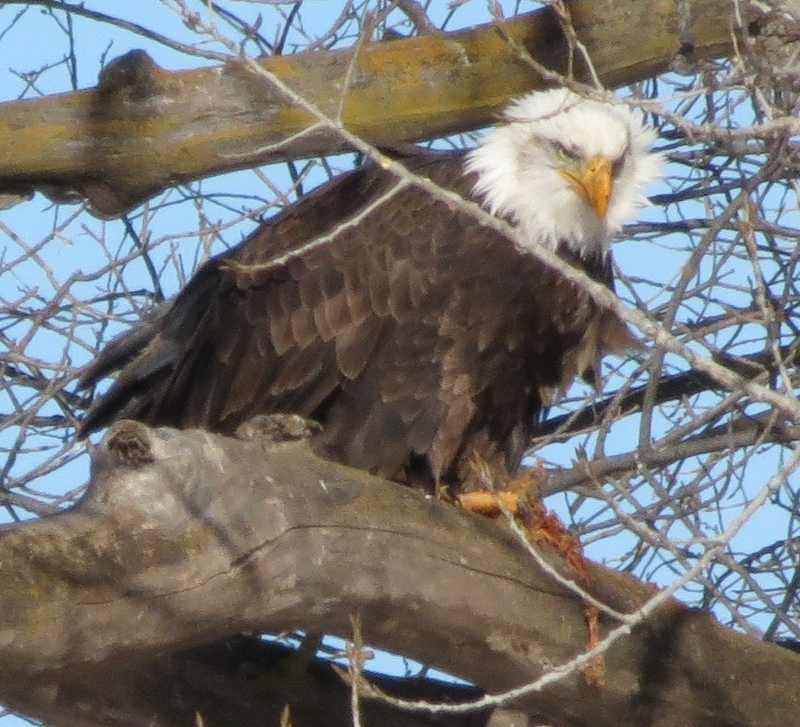 There were more than a dozen eagles down the canal from J-2 yesterday morning, including brown immature birds and dynamic black and white adults. However, they were a little too far away for good photos. Mary Jane enjoyed watching them from inside the powerhouse. I took her there one other time two years ago and we saw exactly one eagle. I’d been there the week before in 2013 to do a story and there were several very close to the building. We both know and accept that you can’t design, request or conduct events that involve wild animals. We tried a few other side roads near J-2 and then I suggested we go to the Kilgore Island road southeast of Kearney where I had photographed some eagles for the Hub on Wednesday. 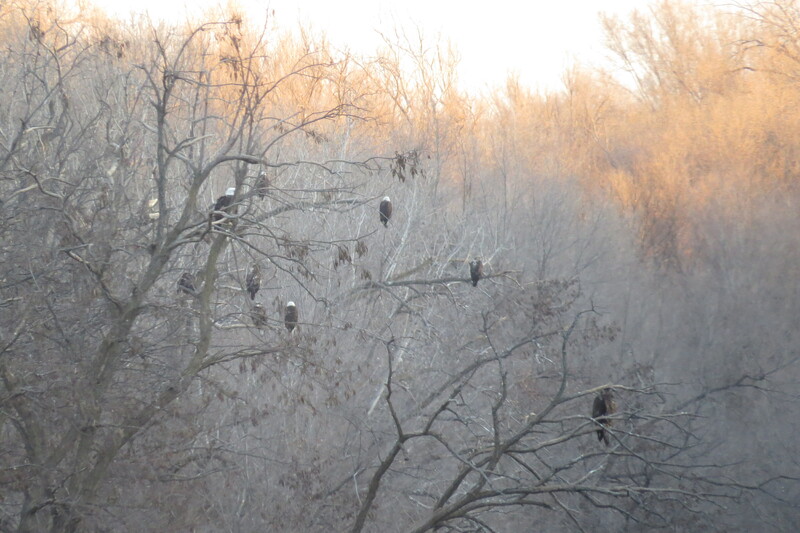 They hang out in a certain row of big trees along the Platte River’s north channel where they can hunt in the river or in the area farm fields. I got some good shots of one eagle enjoying a Wednesday lunch of something furry he had caught and brought back to his favorite tree limb. Those eagles were in that area again Saturday morning, but only a couple spent any time in the trees. Mostly, they stayed about a quarter-mile away in the field. I think I was more disappointed than Mary Jane at not getting closer encounters Saturday. Still, I’m always amazed to see the bird that is our country’s symbol. When I was growing up in the 1960s and 1970s, they were on the endangered species list because, it was learned, their exposure to certain pesticides caused their eggs to be too brittle to allow babies to survive. Then, you would have had to go to Alaska to have any good chance of seeing a bald eagle in America. The thought of ever going eagle viewing in central Nebraska, 1,500 miles from an ocean, with no mountains or forests … at least in the way most folks would define them … was outrageous. So how wonderful and amazing it is to be able to do that today! That said, I’m counting the days to go to Alaska to the 2015 NFPW Conference in September, where I’m sure I’ll have many wonderful opportunities to photograph eagles and other wildlife. I’ll sign up for the tours our Alaska members are planning for us as soon as they’re ready to post all the details for those adventures and the conference too. I hope I’ll see you there. If you get a chance, check out the Pa. Game Commission’s live feed of an eagle’s nest at Codorus State Park (in eastern Pennsyvania.) We’re all getting ready to watch for eggs and baby eagles. But nothing is happening fast. Still, it’s great to watch these majestic birds.